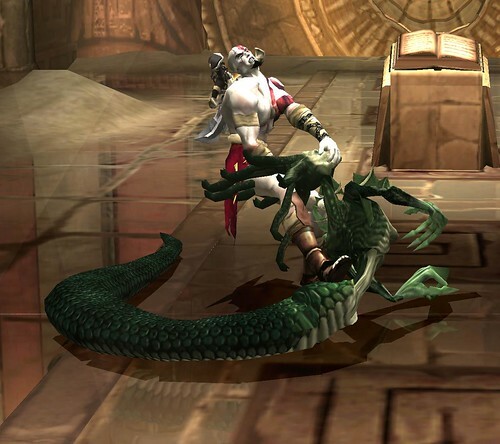 God of War was a weird one to play. 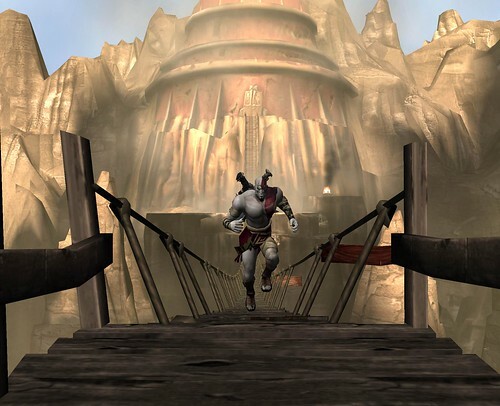 The thing is, even though I’ve never played the original God of War before, I feel like I’ve played it a lot because of how many imitators there are out there. 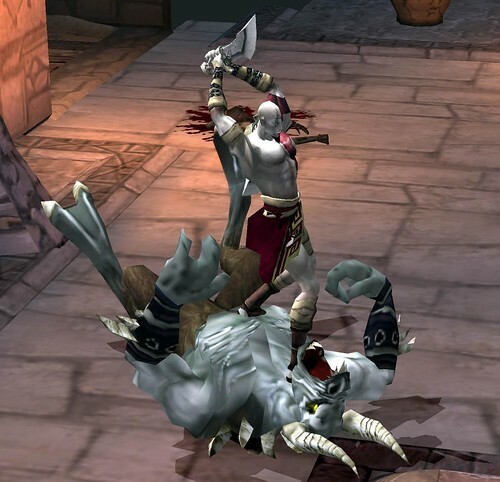 Going back and playing the game that launched a genre (as far as ‘God of War clone’ is a genre at least) was always going to be a bit intimidating. 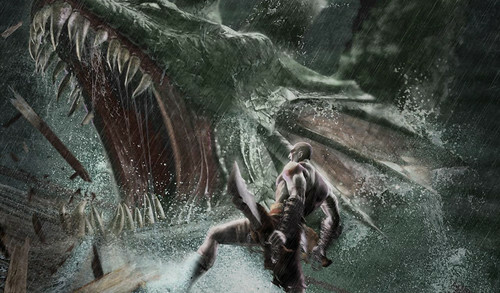 The good news is that God of War still stands up as being a really good game. The fight system is simple to learn but just complex enough to offer you options in combat. 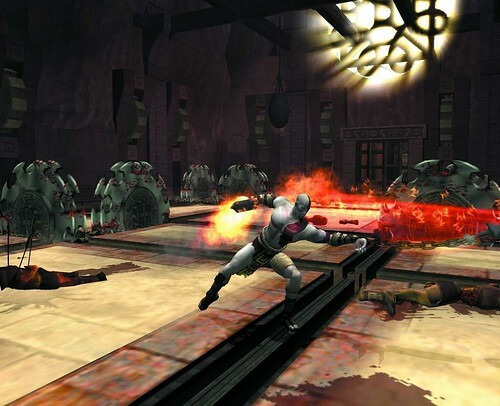 The enemies all have very unique and distinct designs which makes it easy to know, in the heat of battle, which opponents require which strategies. It’s all very fluid and most importantly, fun. 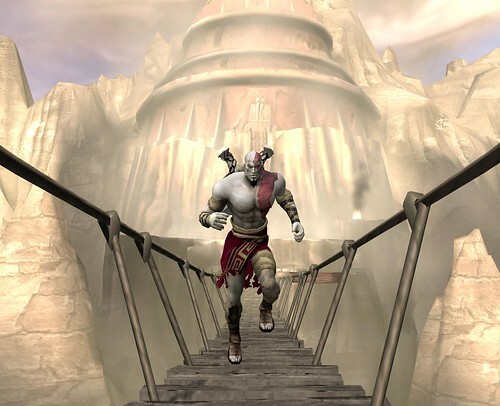 Let’s address what might be the most controversial thing that God of War gave us: Quick Time Events. To be honest they weren’t as awful as I was expecting. Quick Time Events (or QTEs) come in two flavours: QTEs used to kill standard enemies and QTEs used to kill bosses. The standard enemy killing ones are a short three button input (or sometimes hitting one button rapidly) and, most importantly, are optional but reward you for doing them. You kill an enemy by hitting it with normal attacks or you can use the QTE which usually gets you a bit of extra health or magic. The other QTEs are the ones you use to kill bosses which have the problem that all boss killing QTEs have: you’re focusing so hard on not missing the button prompts when they show up you never really get to see whatever cool boss-killing move your character is actually doing. On a personal level, I found the worst part about these QTEs to be how unfamiliar I still am with the PS2 controller. “Awesome, time to kill the boss. Wait? I have to press ‘triangle’? Which button is ‘triangle’? Is it this one? Oh, wait, I already failed the event.” Now I know there’s a better way to do these things because I’ve played games that do it better, games that don’t just show you to press the X button but to press the X button which they visually show you as the left button. Of course the games that have the better way of displaying QTE commands are the ones that are riding on God of War‘s coat-tails and I imagine it’s a lot easier to put little improvements on a system someone else made than to develop your own way of doing it for the first time. The game also likes to mix things up by throwing in some Legend of Zelda-style puzzles (usually of the block pushing variety) which are simple enough and a nice little diversion from all the combat. Unfortunately the game also likes to throw in some platform jumping and this is annoying and not fun at all. (It’s no Zen level in Half-life but it’s still bad). One of the best things about God of War is how natural the world feels for the kind of game it is. The world is all massive pillars, huge ship wrecks and twisting sewers and it all works for the game’s larger-than-life feel. Everything in the game makes sense (more or less) for this world. 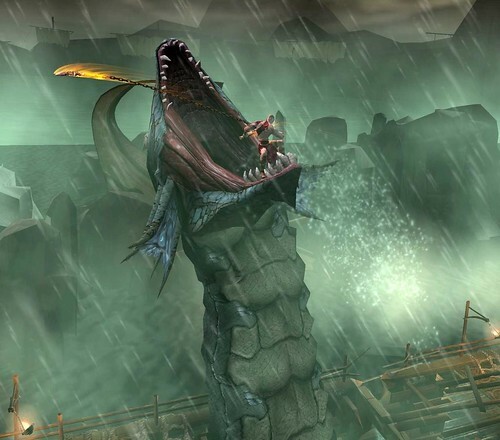 Platforms you need to jump on are broken columns, switches you need to pull are part of Indiana Jones-style tests. 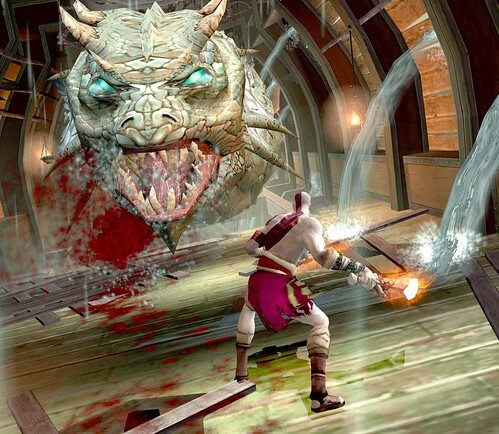 It all feels like a world that Kratos could actually live in and not just a video game level. Until you get to the Underworld. Just because I don’t want to end this section on a downer (and because I think it is a genuinely well designed game overall) I’m going to talk about one of my favourite moments from the entire game. I was walking along and I saw a ladder leaning against a wall. This being a video game, my instinct is to immediately climb that ladder and when I get to the top of the ladder I found that I can continue climbing up the wall. No joke, this blew my mind. It is one of the most clever ways I have ever seen to teach a player a new piece of information. Everyone knows ladders are for climbing so using that knowledge, the developer show that some walls can also be climbed. Seriously, I think that is one of the most clever pieces of design I have ever seen in a game. The part of the game that holds up the least is the story. It’s…well I can’t decide what it is. It’s incredibly grandiose, melodramatic and dumb at times but is that terrible writing? Or is it brilliant writing because of how perfectly it fits the over-the-top combat and world they are trying to build? At one point you learn that (spoiler warning if you care about the story in this game) Kratos has white skin because he is permanently covered in the ashes of his dead wife and child. I was gobsmacked to learn this. It’s trying so hard to be serious and mature but it actually works in the ridiculous over the top world they’ve made. 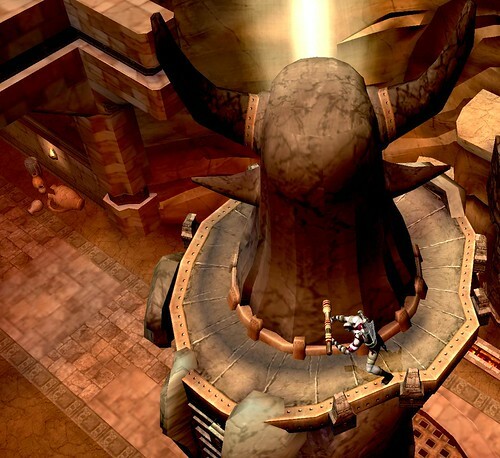 This is a game where Pandora’s Box is locked away inside a temple the size of a mountain that is carried through the desert on the back of a Titan. In a world where something like that exists then sure, why not have Kratos be covered in the ashes of his dead family? Whatever, just roll with it. Probably the biggest problem with the story is women. There are three kinds of women in this game: women who help Kratos, women who exist only to die and women with breasts. Hell, there’s one character that does triple-duty by filling all three of these functions. This treatment of female characters coupled with how super many and tough Kratos is, and the way that all of his problems are solved with bloody violence…well it just leaves a bad taste in my mouth. Maybe if there had been even one female character that wasn’t just there to get her breasts out or provide exposition it would have been ok.
Oh well. That’s all in the past. The important thing is that in these enlightened times of 2013 we definitely don’t still have a problem with women in games existing solely for male player titillation or motivation via their gruesome deaths because we have all learned from the mistakes of games like God of War. Right? We definitely don’t have any problems with representations of women in games anymore, right? 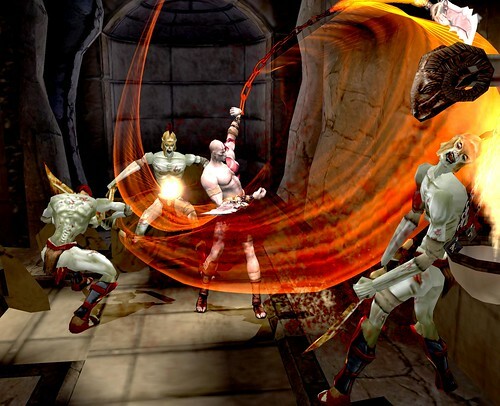 Having now played God of War, it’s easy to see why it spawned so many imitators. Even now it still holds up as a really fun and well crafted game that I would recommend people play (unless you think you won’t be able to separate the treatment of women from the rest of the game. In that case, stay the heck away from this game).